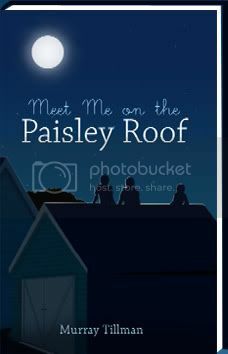 The Broke and the Bookish : Julia Reviews "Meet Me on the Paisley Roof"
I've come to realize about myself that when I read a book, I really like it to be plot driven. That wasn't the case with Meet Me on the Paisley Roof. This book follows around Trussell Jones over a summer right after he turns 16. He lives with his step mom, whom he lovingly refers to as Shrimp Boat. Some of his main obstacles are trying to get her to let him drive and the girl he's been in love with forever but too afraid to make a move on, Ellen. This book has really strong characters, even the secondary ones. They are so strong that I can picture them jumping off the page and meeting them in real life. But when I read a book, to get me hooked and wanted to keep pages turning, I need more than that. Paisley Roof is like opening up a window into the life of a 16 year old boy from the south in the 50s. That's not to say that it is bad, it is what it is. A look into someone's life. It didn't keep me hooked wanting more. Trussell, however, was a wonderful protagonist, his monologue kept things quite interesting. Along with the great characterization were some wonderful one liners that made me laugh. Or certain situations that I could compare to my own childhood, but overall I guess this book just didn't do it for me personally. If you like a book about everyday life (with a few teenage shenanigans thrown in there for good measure) with a sense of humor, this is your book. It just wasn't mine. Found your blog via Bev from My Reader's Block. Am a new follower and look forward to your future postings. I can be found here. Hmm...sounds like a different sort of read, but fairly interesting. Definitely understand about the plot driven aspect....wishing you happier reading on your next pick! Thanks. It was tough to review this because it wasn't a bad book. If it was poorly written or the characters were cardboard it would be so easy to just say that. But it wasn't, just not my cup of tea.